During our time at the CMS Summer School at Katoomba, our family has been greatly blessed by the hospitality of Paul Innes, who operates Blue Mountains History Tours. As part of Paul’s history work in the Blue Mountains, he regularly contributes history articles to the Scenic World Tourist Magazine. The latest story from the Summer 2016 edition concerns the history of the Katoomba Christian Convention. The full article appears below. The information is based on Stuart Braga’s 2003 book A Century Preaching Christ. Katoomba Christian Convention 1903 – 2003. In the late 19th Century, holidaymakers began to visit the Blue Mountains during Summer, to enjoy the region’s cooler temperatures, fresh air, waterfalls and views. For some families, the attraction of staying in the upper Mountains over Summer lead them to build holiday homes, where they would stay for weeks at a time. One such family were the Youngs who built a home in the late 1890’s at the end of Katoomba Street, which they named Khandala. The two-storey Swiss style home, with its views of Jamison Valley, also became a destination for the friends of Ernest and Margaret Young. Some of the friends who stayed with Ernest and Margaret were Ministers of Religion, for the Young’s were Christian people who wanted to share their home and their faith in Jesus – in fact with any visitor who stayed with them. Ernest Young developed the habit of, following breakfast, sharing the Scriptures with visitors who stayed at Khandala. This practise became known, and as more and more people visited, the Youngs began to think of hosting a more formal gathering or Convention at their home, each Christmas. And so, in 1903 the Katoomba Christian Convention (KCC) was born. At Christmas in 1904, Ernest Young’s sister Florence travelled down from Bundaberg in Queensland to join her family in Katoomba. Florence brought eight Solomon Islander Christian men with her, and their inclusion in the 1904 Convention highlighted the motto adopted by the Convention of “All One In Christ Jesus” (Galatians 3:28). This inclusion was also in stark contrast with the ‘White Australia Policy’ which became the law at the time. While visiting the 1904 Convention, Florence Young declared she would travel to Malaita Island in the Solomons to visit Solomon Island Christians she had known at Bundaberg. Her decision and subsequent visit is still remembered today in the name Malaita Point – a portion of the cliff top which overlooks the Jamison Valley, just along from Scenic World. From 1905 onward, ever growing numbers of people to the Conventions determined the need to house the visitors in a large tent, or marquee, erected in Khandala’s grounds. By the late 1930’s close to 800 people were listening to Guest Speakers, Bible Readings and joining in Hymn Singing in the week just after Christmas. In that decade, the Convention expanded its program with the opening of a Prayer Tent, Book Tent, Children’s Program, Ladies House Party and Children’s House Party. Furthermore, while most visitors supported the local tourist economy (as they do today) by staying in Guest Houses and Rented Cottages, a Men’s Camp was established in bushland near Khandala for single men, including Uni Students, whose budgets were more limited. Sadly, Ernest Young died in 1927, and while Margaret continued to host Conventions after his death, it became apparent by the early 1940’s that the time had come for her to relinquish her role and the Khandala links with the Conventions. A new site was found and cleared in Forster Road, near Echo Point. However, for several reasons a bigger site was soon required. 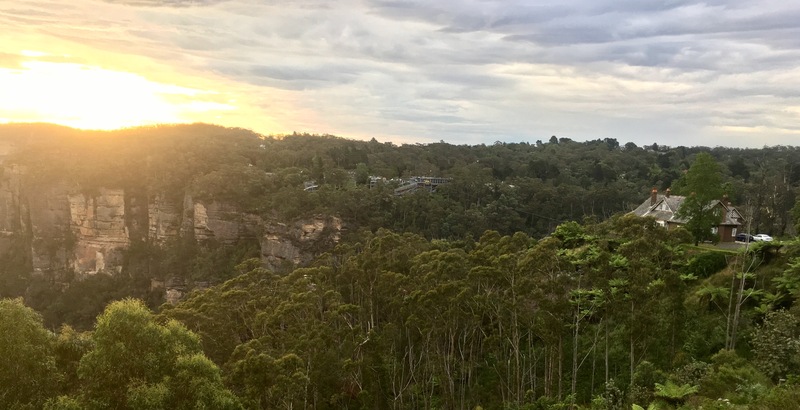 In the 1950’s, a new (and the current) site was acquired when the Deck family sold their large property known as Culverden to the Katoomba Christian Convention. The Culverden house and 19 acre property had initially been purchased in 1901 by Ernest Young’s sister Emily and her husband John Deck. However, by the 1950’s the Deck family only wanted to keep the house. Gradually, the hill site opposite Culverden, through the work of faithful volunteers, acquired a steel framed Auditorium with a dirt floor, Accommodation Huts, Amenities Blocks, Dining Hall and importantly a Lodge to house Guest Speakers. In the 1960’s, further changes occurred. In 1960, the Church Missionary Society (CMS) began to conduct their January Summer School on the Culverden site. Then in 1962, an Easter Convention began. After a decline in interest during the late 1960’s and 1970’s, numbers picked up again during the 1980’s. In January 1988, for example, a tent big enough to house 6,000 visitors (!) was erected on site, and during the 1990’s Men’s and Woman’s Conventions and Kyckstart began. New generations were coming, and now, in the early 21st Century, the Youngs’ 1903 vision to share the Scriptures with visitors to Katoomba continues. Perhaps this year you’re one of those visitors …? Paul Innes, 2016. Paul would like to acknowledge the helpful assistance of Stuart and Patricia Braga in the editing of the article.